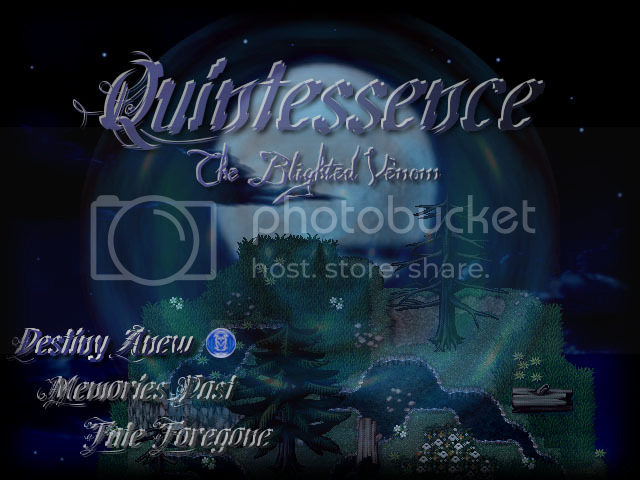 Add a screenshot to the game Quintessence - The Blighted Venom. Chapter XI - The Origin released! Started over 3 years ago, Quintessence is my first, and main, RM project. Unlike traditional RPGs, it has a primary focus on story-telling and atmosphere, delivering a unique experience as a narrative-driven "interactive show". With an award winning original soundtrack comprised of over 60 songs composed by James Q. Zhang and Kan "Reives" Gao, music is not only an essential component of not only Quintessence's atmosphere, but also the plot itself. The opening and ending themes feature performances by the talented Laura Shigihara and Adam Mussell. The genre of the story is adventure, drama, and fantasy. Instead of a synopsis, here is the opening of the written version of the game's story. 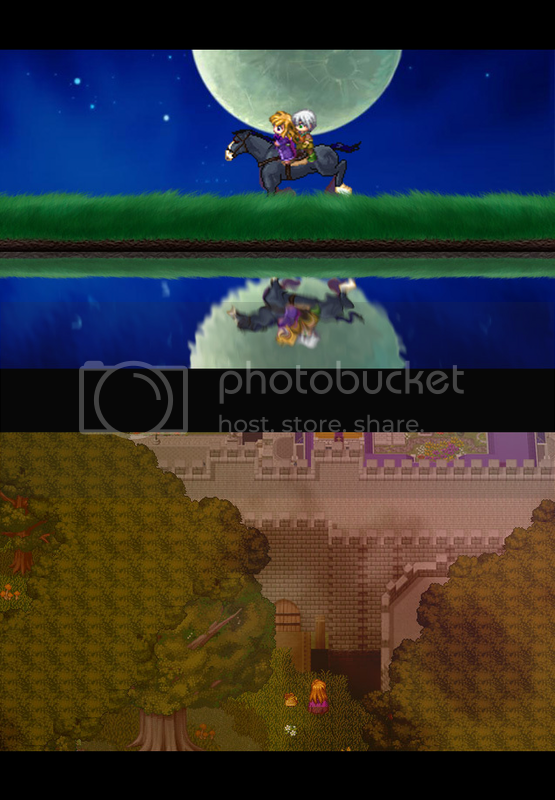 While the scene is not directly implemented in-game, the events surrounding it are. The vase met the ground with a loud clash as the young man dashed by. With trembling hands, he reached under his grass-sewn bed sheet and retrieved a notebook, a quill pen and a bottle of clear, oily liquid. Dampening the quill in the bottle, he flipped to the blank page, fleetly trotting down the words as sweat dripped down onto the tawny pages. I knew something was out of place, but not like this. . .
What does it mean? No, I cannot state this here, for it is not safe. But it is still her. In either case, it has been this way for who knows how long now, and nothing has yet happened. Perhaps I still have time. Perhaps, just perhaps, I still have a chance. He took a deep breath and wiped the sweat off his forehead. Redampening the quill in the chipped bottle, he signed briefly at the bottom of the page as the rough handwriting gradually faded into the thin air. The exhausted figure pushed himself up and darted through the opening of the leathery tent. He paused for a moment and stared into the dim lit night, only to hear the wind whistling through the trebled leaves. Dim, silvery moonlight sprayed upon the rustling branches, brushing gently against the autumn night's air. With another sigh, he began to saunter silently onward, but the sound of soft footsteps upon the grass made him stop in his track and turn around. Turn around to face the familiar figure that was now a stranger. "Why are you still up at this nightly hour?" The figure spoke softly, with a tone that Reivier had embraced countless times. "Do you not wish to have a restful sleep?" It added after a brief pause. Reivier's brows lowered as he took a small step back. His trembling hand instinctively reached behind his belt for his hunting knife, but it was too late. Under the cloaking shadows, the figure swiftly lashed out something colorless, shimmering in the reflection of the guiding moonlight. But that was the last thing he saw. Being an interactive show, game-play is delivered in a relatively limited quantity. 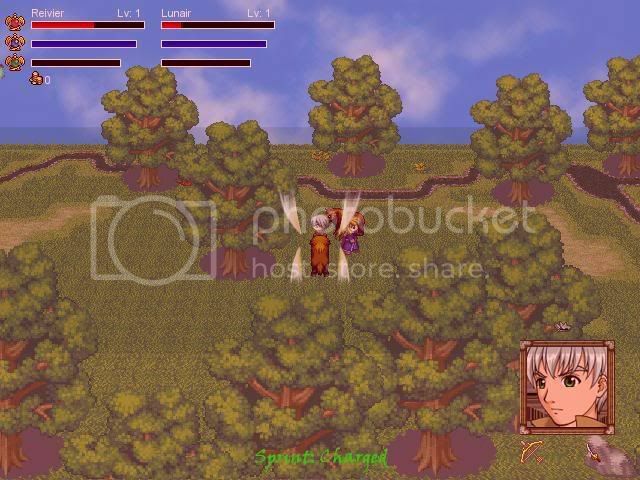 However, it offers a wide variety of gameplay through puzzles, mini-games and its evented real-time battle system. And there ends my WIP sales pitch; many thanks for your time reading. 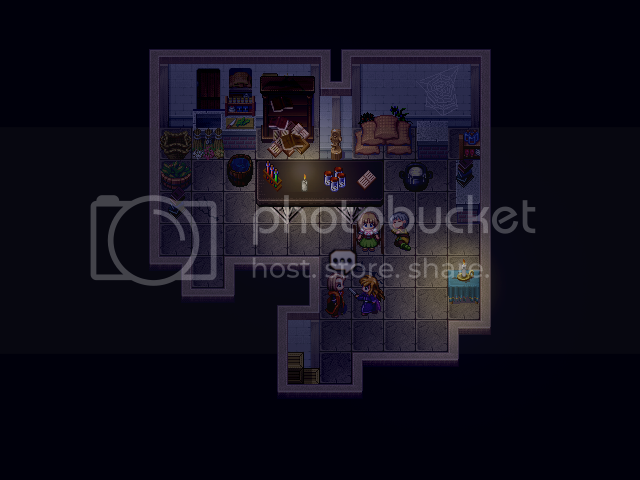 Now, would you like to download this? Thank you! Download link's at the top of the page. Last edited by Reives on Sun Nov 29, 2009 12:19 am, edited 16 times in total. 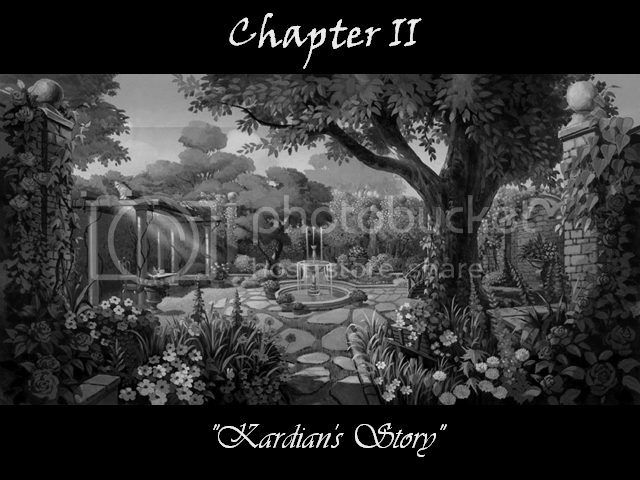 Also, I think you mixed up Kaire and Kardians face graphics in the character area. Hope to see some screenshots of chapter 2 soon. Oh, hey Falcon. :> And thanks for the notice, I fixed their face graphics now. I am able to extract some chap. 2 screenshots in the near future, will do that then! Last edited by Reives on Thu Nov 01, 2007 5:51 pm, edited 1 time in total. In the future, if you want a thread moved, just Report it, instead of putting something in the title. That way the staff doesn't have to go through the extra step of editing your thread title for you. Right, I just noticed. My apologies, I thought titles were editable. Last edited by Reives on Thu Nov 01, 2007 5:56 am, edited 1 time in total. I've had the pleasure of playing this game on another site. This is one of the few demos that I have played through completely in one sitting. Reives is a wonderful storyteller. Please do not pm me to ask me to join your team or to ask a support question. There are forums to make such requests. The battle demo is corrupt, just FYI...I downloaded it 3 times.. Thanks Alexia! And Shifter, I will look into that, thanks for the info. I got a new CBS beta up now, it should work this time. Also, this time I implemented MGCaladtogel's Mode07. It might be a little laggier than usual, but should be fine on most updated computers. Last edited by Reives on Sat May 26, 2007 11:36 pm, edited 1 time in total. I'm inclined to agree with Alexia. This was an absolutely excellent play. The way the game progresses is so well threaded. The story is solid, and I don't think I could recall one loose end in that department. An amazing display of consistency and concept. You have me addicted with that alone. The characters are adorable, especially Vikon. As a whole they all have very solid personalities, you can distinguish them quite easy by their attitudes alone. They are also easy to like, which is something I don't find too often in RPGs period. I think in a way you wrote that demo to force the characters on to the player, because I can't recall many times that I've remember the characters on a first play. Very nice job. The game's execution is top of the line. You get the feel that you're playing an actual RPG and not just another RMXP game. You did a very good job on the battle choreography in the beginning, that alone draws the player into seeing the rest of the game and wanting more. I can tell that the extra effort and time was put in to make sure this was as flawless as possible. Overall, extremely good job. I'm quite impressed to say the least. Oh I completely forgot to comment about the music. You loss some point for where you stuck in the RTP music, but I take it they were place holders. Anyway, for the most part the musical arrangement was a very nice and soft touching one. Kept the mood right. Last edited by Jstreet on Sat May 26, 2007 11:39 pm, edited 1 time in total. Definitely a game I'd play, just because I'm a music freak. I'll go ahead and play the demo, then give you some feedbacks. Seriously, nice work bro. I can tell you're extremely dedicated. EDIT: I.. am amazed. This game is probably the best I've played, granted that I don't download many games, so my opinion may not matter much. Aside from a few grammar and spelling mistakes ("familiar" not "familliar"), everything is almost flawless. Amazing job, definitely get a 10 from me. Last edited by Mezmerize on Sat May 26, 2007 11:54 pm, edited 1 time in total. Wow, thanks for the detailed review, Panda. I'm very glad that you enjoyed it. :D I did focus greatly on developing identifiable characters; in fact the whole story is a modified version of an attempted fiction I was writing two years ago (but every teen had one of those things :p I stopped at a bit over 100 small pages). In fact I found out about RMXP because I wanted to turn it into an interactive story and searched for such a tool, so I'm very happy that the storytelling was decent. And Mez; rock on for music freaks. I'm not sure if it's your prefered genre of BGMs, but hope you enjoy it. Oh and yes, the 3 RTP BGMs are stuck there for now sadly, but they are in fact place holders. Actually, I think I am able to put some of them out for now. They will decrease as of next demo. Last edited by Reives on Sun May 27, 2007 2:08 am, edited 1 time in total. *Edit: and as for an opinion: please don't use mode7! ;. ; I think it would be just fine without it! Last edited by Rye on Sun May 27, 2007 12:57 am, edited 1 time in total. Ah Rye, the mode07 thing was only planned to apply to part of the Intro Music Vid and Battle System to clarify, not the whole thing. Or did you refer to those specifically? :o I am somewhat vacillated with whether to use it for the CBS, but it's pretty good for some specific cinematic effect kind of use, at times. is it just me i don't know.But when I try to download it,it gives me error acess denied.invalid user name or password.Am I need to register or what? Just PM and give some of your project info. Oh I see. I personally thought that battle system was one of the few places where it could be somewhat different from the game-play though. :o Hm, I don't know; I'll have to see on that. Though the lag factor is sorta suppressing me from using that in the final version. I'll definitely keep that in mind though, thanks for the advice! Hm, that's weird. No registering should be required. Thanks, glad you enjoyed it! :D And oy, thank you for noticing that spelling mistake, I better go fix that now before I forget. Last edited by Reives on Sun May 27, 2007 7:33 am, edited 1 time in total. Very nice, really dug the demo..actually played the whole thing through, which is rare for me..
One of the things that caught my interest was the mention of original music (!). The screen shots are very, very nice. You definitely have a lot going for this project, so it'll be great to see how it continues to progress. I'm always in for a good story too, though I think the character profiles are lacking just a bit. I know you may not want to reveal any spoilers, but if you work your way around the spoilers, you can still come up with some intriguing profiles. Just a suggestion, of course! I'll be downloading your demo(s) and checking them out later tonight, and I'll be sure to provide some feedback as well. The game over all just made me awe. You really don't see that many original games out there. I'd definitely play the full version of this game. Really well done, except for a few passability problems here and there. Good luck for the future ! NEW : Rataime's Image Save Files Script. More eye candy ! I'll try to find those passability problems; thanks for the heads up! Thanks, hope you like the original music! :D As for the character detail spoiler part; I'm not really sure. I understand that thread-wise it is a nice touch, but what I feel is that writing a description about a character on a thread is like treating them as a project's subjects each with their attributes/personalities and etc. labeled; where as I want the player to explore their traits themselves in first-person. I definitely see your point though, but I'm a little vacillated right now, heheh. This was really good. ^_^ I'm curious to what happens next. Last edited by Reives on Mon May 28, 2007 6:24 am, edited 1 time in total. I just got done playing the demo and I have to say I'm inpressed. I loved every second of the demo. It kept me glued to the monitor, even when my parents said i have to go to bed XD I love the music, and the battle in the beginning, and just everything! lol I can't wait for the next one =) You give me inspiration for my series. I'd get rid of the purple eyes. @Redblade: Ahh good point, I'll fix that for the black and white flashbacks. Thanks for the advice! @Mezmerize: Heheh, I know that purple eyes + golden hair = mary-sue cliche; but basically what I have is a whole ethnic group(Aerians) are defined by the said physical traits, and considers themselves superior (raging a war of independence in the past from the rest of the society; somewhat relatable to Nazi in WW2). In the flash back back to Aeria's central, every Aerian has those inherited hues, and is one of the foundations for the story. Last edited by Reives on Tue Apr 08, 2008 12:54 am, edited 1 time in total.